Joan Roch running in Parc Jean-Drapeau, Montreal, Que. Winter-like conditions have arrived in most parts of the country which means running and training has basically become harder. Whether it’s slippery, icy sidewalks; sloppy snow-covered trails; or the unrelenting cold temperatures and biting winds, the season offers some of the worst weather and conditions we runners ever face. And while escaping indoors to the safety of a track or treadmill may be necessary from time to time, inevitably we are going to have to face the climate and run outdoors. Winter running is first and foremost about safety and comfort. Wearing the appropriate gear, being seen in the dark and staying warm and protected in the face of dangerously cold conditions must always be a runner’s top priority. This is why what you wear, where and when you run and who you’re with should all be carefully considered before heading out for any run. But once you’re ready to run, have dressed properly and chosen a route that is safe and conducive for running, you may still find yourself struggling physically or psychologically. Running in the winter is tough at the best of times. 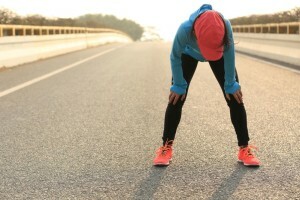 It’s hard to run at all let alone to push yourself to run hard or do a workout. Know that just getting out the door and logging some time on your feet will have tremendous benefits later on. This early part of winter is the best time to build your aerobic base and set an important foundation upon which spring speed and endurance will be built. Base building is almost entirely easy running at a comfortable pace and can be done in as little as 20 minutes at a time. Just remember that a little bit more is better than less and any running is better than none at all. Running in winter also affords several hidden or unseen benefits that few talk about. Given the less than ideal road conditions–slippery, sloppy, snow-covered, etc.–that you’ll run on, your body will be working much harder than it typically would and so will become much stronger. Your heart will work a bit harder to pump blood to the muscles and thus you’ll get fitter with less effort. Your muscles will need to adapt to uneven and slick terrain and thus become stronger, more responsive and more resilient. You may also burn more energy to keep your body temperature at a steady level which could help aid in weight loss or maintenance. Altogether, you’ll be getting “more bang for your buck” without having to put in a greater effort. Plus, if and when you do put in a greater effort–including both workouts and long runs–you’ll also get the desired effect for less, meaning you won’t need to run as fast or as hard (and in many cases, you won’t be able to run as fast). Best of all, training through the winter will make you much more mentally tough. You’ll run through some of the toughest, hardest and least enjoyable conditions imaginable and by the time winter breaks and spring is on it’s way, you’ll be primed and ready to tackle the new season with increased vigor and a solid base of fitness.